However, this is not the case. As a tow truck company, we’re taking orders from the agency that issued the impound. For instance, let’s say you left your car parked in a no parking zone. As a towing company, with a fleet of vehicles, we are not authorized to pull up and tow your car away. By the time the tow truck company is called, there is already paperwork and an order to take it issued by an agency such as the Department of Transportation, CHP or LAPD. We understand how frustrating and inconvenient this process can be, but yelling at the tow truck driver or blaming them for doing their job doesn’t make the process any easier. To be honest, we don’t want to take your car. We have bigger fish to fry like the semi-truck on the I-5 that overturned earlier this morning or recovering a car that went over a hill and into a ditch. While repo and towing companies need specific permits, insurance bonds, certifications, etc. to operate, they can also have various city, state and law enforcement contracts that can assist with their impounds and accident recoveries. While repos and tows both drive and operate tow trucks, they each perform vastly different services. For example, you wouldn’t call a repo truck when you need a jump start, tire change or tow when your car breaks down. Likewise, a bank wouldn’t call a standard tow company to repossess a vehicle when a buyer fails to pay his bill. A repo driver is someone who is (usually) hired by a debt or collection agency to locate and recover property in which debt is owed. Repo drivers typically work for repossession companies, but sometimes they work as independent contractors. Like tow companies, they also have their own strict requirements to operate. So while we may drive the same trucks, we operate in two completely different industries. The fact that we even have to address this stigma is somewhat disheartening. The towing industry is always portrayed in the negative on TV and in movies. Usually it’s some dirty guy in overalls with a beat down wheel lift that is seen taking the protagonist’s car away. Even the hit Pixar movie, Cars, portrayed the only tow truck in the movie as dumb and dirty. While we can’t speak for every tow truck company and driver out there, we can say a few things about how we operate. At Pepe’s Tow Service, we’re a family owned and operated business. That means that we take the utmost pride in bringing on employees that are respectful, and embody our values of reliability and respect on every job. There’s a popular saying in the trucking industry that says, “Take Pride in Your Ride.” This is something we strictly follow to give our customers the best service possible. When you’re in need of a tow, we want to be the company you call. We may specialize in heavy duty towing jobs and recoveries, but that doesn’t mean we aren’t here to help with medium duty towing or roadside assistance. Our tow truck drivers are available 24/7 for all your towing needs. 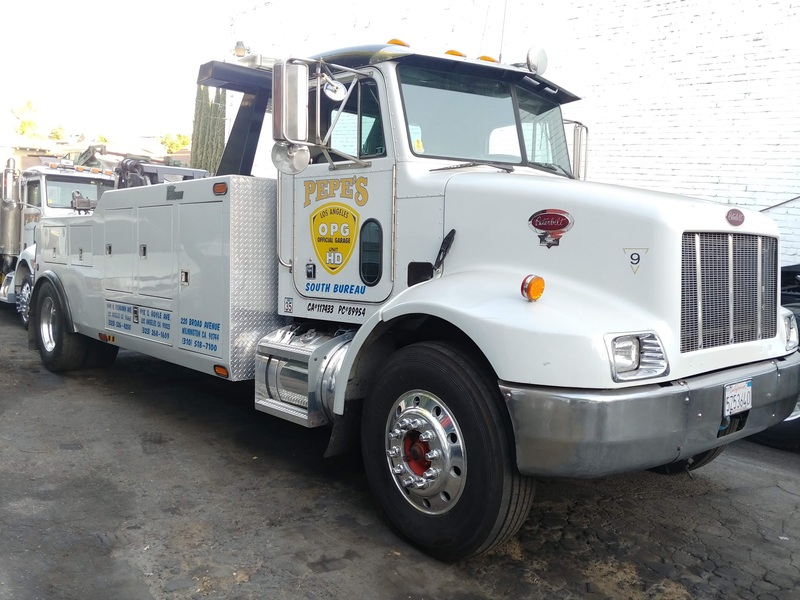 You can rest easy knowing that when you call Pepe’s Tow Service, you’re going to get quick, reliable and respectable service. Almost all tow operators I know love to keep their trucks clean and shiny. I’m sure you’ve gotten plenty of dirty stares when you pull into a parking lot or just driving down a street. Thanks for the support, stay safe as well! That’s awesome to hear! Do you follow us on Instagram as well? I post all of our crazy recoveries there. Thank you! The theme is based on the Official Police Garage colors of gold, black and white. If you go to http://www.opgla.com, you’ll see similarities in the color scheme to the city website. I constantly battle and I just wind up staring empty display for long period of time. More or less, but I feel you on staring at an empty display. At first I thought I wouldn’t be able to post enough blogs, now with my busy work schedule it is very difficult.